I spend a lot of time sitting at my computer desk for work, reading, and even playing a few online games. My little corner of the world (at my desk) had a little desk lamp that would often leave me feeling eye strain and headachy after hours of computer work. I was very happy to give World's first e-Reading Lamp by BenQ a try. 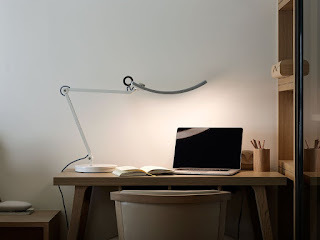 First impression, this is a beautiful lamp. Very straight forward, modern, and simplistic. Easy to assemble, just had to attach the bottom plate. Easy to use, just touch the metal ring at the end of the light for on or off. The dial on the top of the light adjusts not only the brightness but the color of the light as well from bright white light to a soft yellow light for a cozy reading light. This light is very easy on my eyes. I really like that the center of the light gives off more light than the sides, reducing glare and it really lights my whole work area. This lamp with adjust to just about any position too for light where you need it most or to fit the space you are working in. Great job BenQ!